Few people who know retired farmer Russ Earl would call him a tree-hugger. But Russ himself disagrees. “I just don’t squeeze as tight as some,” he says. “I had cow-herding in my blood,” Russ explains. He grew up working on his parents’ dairy farm in Gearhart and tending cattle, sheep, pigs, and mink at Reed Ranch, up the road. As a young man, Russ built up his own cattle herd from a single cow, while cutting hay all over northern Clatsop County and working evenings in the shop at the Crown Zellerbach tree farm. Eventually he was able to buy his own farm at the south end of Seaside, where Circle Creek runs into the Necanicum River at the foot of Tillamook Head. Decades later, a chance meeting with Neal Maine—then NCLC’s executive director and a childhood acquaintance of Russ’s—led Russ to consider selling the 364-acre property to North Coast Land Conservancy. He had run cattle on it for 32 years and was ready for a change. He could have sold the land to someone else, he says, “but there’s a pretty good chance they’d have kicked everybody off, kept them from fishing, and that wasn’t in my comfort zone.” He liked the idea of the land becoming a place where local people and visitors could see conservation in action. 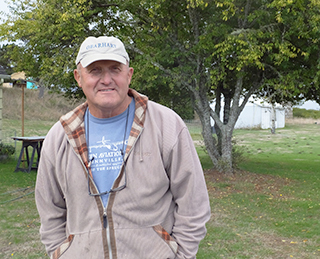 In the years since the sale, Russ has revisited his old farm—now known as Circle Creek Habitat Reserve and Conservation Center—on guided tours. “It’s kind of fun, seeing all the little critters here and there,” he says. He recalls a walk he took with land trust staff through what was then his farm, back when the staff was evaluating it prior to purchase. “We walked down the field and looped around and came back,” Russ recalls. “They found 33 kinds of birds! I had no idea so many bird species were out there.” At the time of the sale, Russ recalls, some folks had suggested he could asked more for the property. Russ shakes his head.